John Roddye LEA [Parents] was born on 21 Jun 1857 in , , Alabama. He died on 28 Apr 1931 in , Pontotoc, Oklahoma. John married Mary Texas LEONARD on 17 Jun 1886 in Sherman, Grayson, Texas. Mary Texas LEONARD was born on 20 Apr 1857 in , Texas. She died on 27 May 1929 in Ada, Pontotoc, Oklahoma. 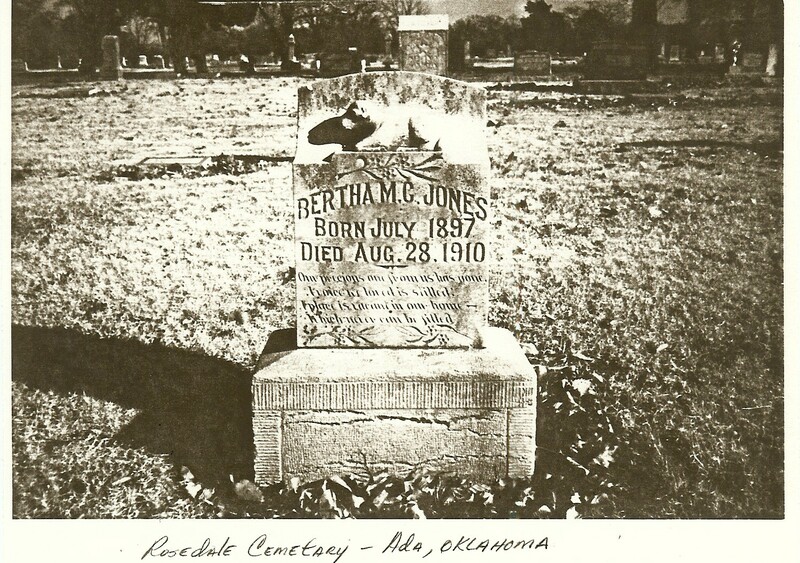 She was buried on 29 May 1929 in Rosedale Cemetery, Ada, Pontotoc, Oklahoma. Mary married John Roddye LEA on 17 Jun 1886 in Sherman, Grayson, Texas. M i Coleman Courtney "Cole" LEA "Sr" was born on 19 Aug 1887. He died on 20 Jun 1955. F ii Mattie LEA was born on 15 Jan 1893. She died on 20 Mar 1978. F iii Minta Ollie LEA was born on 31 Aug 1894. She died on 14 Jan 1985. CLAY. 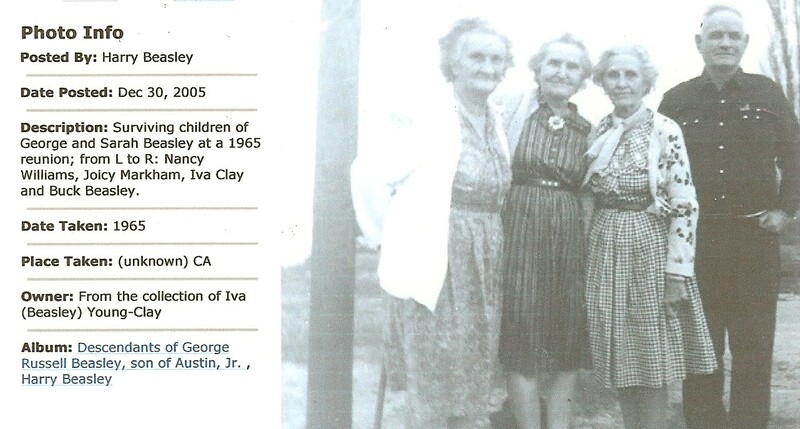 CLAY married Bertha M. JONES. Bertha M. JONES [Parents] was born on 8 Jul 1897 in Wynnewood, Chickasaw Nation Indian Territory, Oklahoma. She died on 28 Aug 1910 in Bebee, Pontotoc, Oklahoma. Bertha married CLAY. Burnell Russell WADE was born on 3 Mar 1809 in , Edgefield, South Carolina. He died on 11 Sep 1873 in Sherman, Pontotoc, Mississippi. Burnell married Martha Smith "Mittie" STOCKER on 15 Dec 1836 in , Sumpter, Alabama. Martha Smith "Mittie" STOCKER was born in 1810 in , , South Carolina. Martha married Burnell Russell WADE on 15 Dec 1836 in , Sumpter, Alabama. James Lewis WADE was born on 12 Sep 1837 in , , Mississippi. Mary Adeland or Adelaide WADE was born in 1839. M iii Burnell Henderson WADE was born in 1844. F iv Pernecia Rebecca WADE was born on 19 Apr 1846. She died on 14 Aug 1894. M v Jesse Irvine WADE was born on 11 Mar 1849. He died on 1 Jan 1927. George FITZSIMMONS was born in 1842 in , Mason, Kentucky. George married Rebecca GUTHRIE on 30 Jan 1862. Rebecca GUTHRIE [Parents] was born in 1844 in , Mason, Kentucky. Rebecca married George FITZSIMMONS on 30 Jan 1862. John Wilson HARRIS was born on 1 Jul 1859 in Ledonia, Fannin, Texas. He died in Durant, Bryan, Oklahoma. John married Georgia Ann HARPER. Georgia Ann HARPER was born on 4 Apr 1870 in Springfield, Greene, Missouri. She died on 20 Aug 1950 in Durant, Bryan, Oklahoma. Georgia married John Wilson HARRIS. F i Callie Ivory HARRIS was born on 27 Feb 1896. She died on 28 Jun 1969. Isham PETERS was born about 1818. Isham married Elizabeth "Lizzy" LACKEY. Elizabeth "Lizzy" LACKEY [Parents] was born on 6 Mar 1822 in , Pike, Illinois. She died on 10 Apr 1906 in Indian Territory, Oil Center, Pontotoc, Oklahoma. She was buried on 12 Apr 1906 in Box "X" Cemetery, Bebee, Pontotoc, Oklahoma. Elizabeth married Isham PETERS. COCHRAN, William Henry "Bill" "Sr"
Malvena PETERS was born in 1838/1840 in , , Illinois. John W. PETERS was born about 1844 in , , Illinois. William JONES was born about 1818 in , , Illinois. He died in 1846. William married Elizabeth "Lizzy" LACKEY about 1846. Elizabeth "Lizzy" LACKEY [Parents] was born on 6 Mar 1822 in , Pike, Illinois. She died on 10 Apr 1906 in Indian Territory, Oil Center, Pontotoc, Oklahoma. She was buried on 12 Apr 1906 in Box "X" Cemetery, Bebee, Pontotoc, Oklahoma. Elizabeth married William JONES about 1846. Isafena A. JONES was born in 1848 in , , Texas. Mary E. JONES was born about 1860 in , , Illinois. Walter PETERSON. Walter married Nancy Eleanor BEASLEY about 1908. Nancy Eleanor BEASLEY [Parents] was born on 3 Feb 1890 in Mesquite, Dona Ana, New Mexico. She died on 17 Mar 1977 in Oakdale, California. Nancy married Walter PETERSON about 1908. Arthur Wilburn MC CURRY [Parents] was born on 22 Nov 1896 in Ada, Indian Territory, Oklahoma. He died on 13 Mar 1977 in Ada, Pontotoc, Oklahoma. He was buried in Highland Cemetery, Ada, Pontotoc, Oklahoma. Arthur married Vera Mae HOUSE on 4 Apr 1923. Vera Mae HOUSE was born on 12 Feb 1901 in , Scott, Arkansas. She died in 1979 in Wichita, Sedgwick, Kansas. She was buried in Highland Cemetery, Ada, Pontotoc, Oklahoma. Vera married Arthur Wilburn MC CURRY on 4 Apr 1923. M i Leon Wilburn MC CURRY was born on 12 Feb 1931. Joseph Robert GRAHAM was born on 9 May 1895 in Marietta, Indian Territory (Now Love County), Oklahoma. He died on 13 May 1972 in Ada, Pontotoc, Oklahoma. He was buried on 26 Jun 1972 in Rosedale Cemetery, Ada, Pontotoc, Oklahoma. Joseph married Myrtle MC CURRY on 16 Jul 1930 in Ada, Pontotoc Co., Oklahoma. Myrtle MC CURRY [Parents] was born on 7 Dec 1898 in Ada, Indian Territory, Oklahoma. She died on 23 Jun 1997 in , , Louisiana. She was buried in Rosedale Cemetery, Ada, Pontotoc, Oklahoma. Myrtle married Joseph Robert GRAHAM on 16 Jul 1930 in Ada, Pontotoc Co., Oklahoma. M i Joe Bob GRAHAM was born on 13 Sep 1933. M ii Billy Mack GRAHAM was born on 8 Sep 1935. He died in Mar 1998. M iii David Lee GRAHAM was born on 6 Jul 1938. F iv Alice Ann GRAHAM was born on 11 Jul 1941.